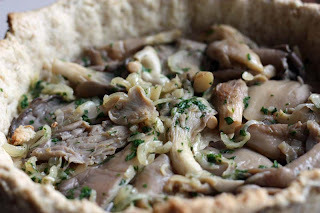 I’ve made mushroom tarts, quiches and flans before, but never with oriental mushrooms. 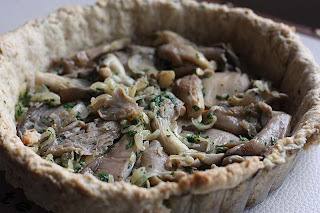 This tart made with shiitake and oyster mushrooms was going to be interesting for the both of us. Actually the oatmeal pastry was new too. The oriental mushrooms kept their mild flavour and moist texture - velvety or rubbery - depending on your perspective. The oatmeal pastry was a breeze to roll out, unlike other pastry crusts that break up upon rolling with you having to do a lot of patchwork. The taste was unusual though, I don't know if it complimented or clashed with the oriental mushrooms, but it wasn't bad. Sift the flour and salt into a large bowl. Rub in the butter until the mixture resembles fine breadcrumbs. Add the oatmeal and combine. Add 2 tablespoons of water and mix to a firm dough. Chill for 30 minutes before using. Roll the pastry and line a 8 inch tart tin. Chill for 20 minutes and blind bake for 15 minutes or until the pastry is cooked. Reduce heat to gas mark 4. Melt the butter in a pan, add the garlic and shallots and cook over gentle heat until soft. Turn up the heat and add the mushrooms to the pan and cook until they have softened. Add the parsley, then remove from the heat and allow to cool. Mix the eggs with the milk. Season with salt and pepper. Add the cooled mushrooms. Pour the filling into the baked pastry case and place on a baking sheet in the oven. Bake for 30 minutes to 40 minutes or until the filling is just set in the middle. Serve hot or at room temperature. Filling slightly adapted from Leiths Baking Bible. i'm a big fan of mushrooms, so your mushroom tart appeals loads to me! 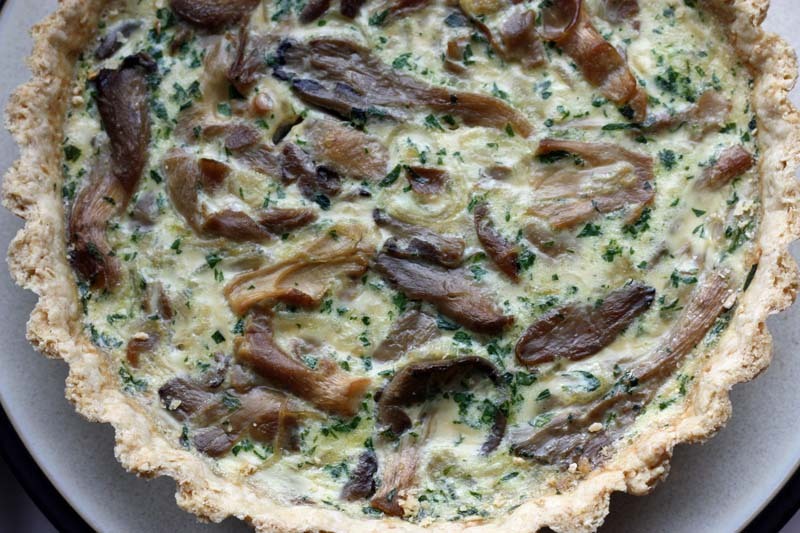 can we use other mushrooms for the tart too? The filling has me totally drooling! Thanks for sharing this new treat. Looks beautiful. We've been eating a lot of oyster mushrooms over here lately. I love them. Hadn't thought of doing a tart. Great idea! 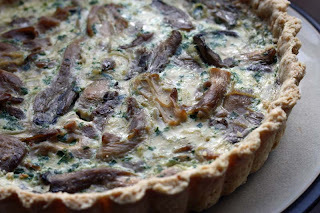 I so adore oyster and shiitake mushrooms... your tart sounds heavenly!! ps. your parsnip soup looks amazing. That looks like it turned out lovely. Nice idea with the oats. I live shiitake! So good for you too! Hey, I need a good recipe for parsley. I have a lot of it. Help please herb queen? the tart looks very inviting!! can very well imagine the aroma that comes wn it gets baked!!! Actually worked okay in a tart. The oatmeal base was unusual, but after the first bite it was fine with these particular mushrooms. Thank you so much Vegetarian Girl. 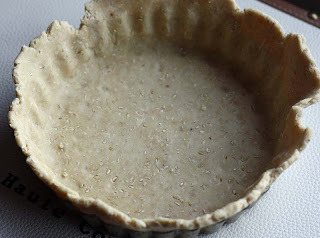 The oatmeal base was an intersting base from ordinary shortcrust. Yes, I do have a good recipe for parsley. I also have a recipe for parsley soup. Let me know if you want the recipe for that and I will post it here. Thank you so much MiniBinoy. Oh the aroma of the tart certainly was different from standar mushroom tarts. Your tart sounds delicious to me MangoCheeks, but you don't sound too keen? Oatmeal is quite hard to get down here, but I'm going to have to try because pastry that doesn't crumble just has to be tried. Oatmeal in a pastry, that's a first. I'll give this a try. Looks delicious. I love mushrooms and this tart looks very delicious! I think the first bite was just a bit unusual, but once you get over the contrasting flavours and textures, its okay. They do pinhead and medium which is what i used in this recipe. I've seen it in Tesco too. Hopefully you'll find some there. Please do, the texture of the pastry is really good. I will def. be making it again with different toppings. And here is the Parsley soup recipe. To make the stock bring to the boil all th ingredients and allow to simmer for at least an hour before straining and using (discard the veg). This is also excellent as a hot drink. To make the soup, heat the oil in a large pan and fry the potatoes and garlic over low heat for about 15 minutes, stirring occasionally until they are nearly soft. Add the parsley and pour the stock over slowly. Add the stock powder and simmer for 15 minutes depending on how thick the leaves are. When the potatoes are completely tender and the parsley has collapsed, blend smooth and adjust the seasoning. I hope you like. Let me know how you find it. Thank you so much Ellen aka La Pure Mama. This was an excellent recipe, although I needed to make some changes due to what was on hand and did alter the method a bit. As we don't seem to have "medium" oats here in Northern Alberta, I used quick rolled oats, not "instant" or "old fashioned" and I think it was a reasonable substitution. I ended up rolling the pastry out onto a cookie sheet, prebaking it, then topping with the mushroom mixture. I used Shitake mushrooms only. I didn't add the eggs or milk (Mangocheeks, although the milk is in the directions, it isn't actually listed in the ingredients), and then I really took some liberty with the recipe by adding a few sliced black olives and feta. Still, the oatmeal flavour of the crust came through nicely and I think it complimented the mushrooms. Leftovers were also very tasty. Thank you for another wonderful recipe. Ooh - oatmeal pastry sounds very interesting! Thank you so much for your lovely comment Judith. I am do delighted to read that you enjoyed your variation. I have to admit that i am extremely intrigued by the shiitake mushrooms, black olives and feta combo and will have to have a got at trying it someday. So pleased to read that you were able to sub. the medium oat with rolled oats. Thank you so much Food Hunter.